New to me, but certainly not new to the catalogue are recordings by the Pratum Integrum Orchestra on the Caro Mitis label. Caro Mitis is the premium classical label of the Russian Essential Music record company, and their catalogue ranges from early music to Britten, Prokofiev, Hindemith and Schnittke. The Pratum Integrum Orchestra is Russia's only early music ensemble with the forces to tackle the orchestral repertoire. 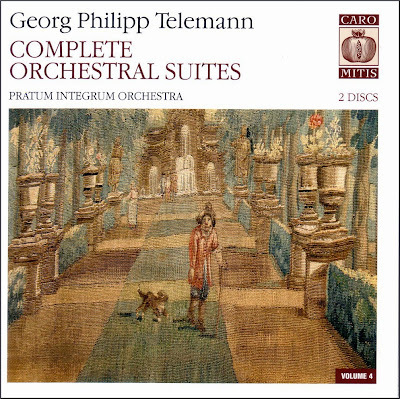 Their award-winning recordings of the Telemann orchestral suites have provided me with much rewarding listening. Spirited and persuasive playing is coupled with excellent if slightly dry SACD sound captured in Studio 5 of RTR in Moscow. Recording and post-production is outsourced to Polyhymnia International, an independent Dutch production facility specialising in SACD format recordings that rose from the ashes of the Philips Classics recording centre in Baarn. All the hardware in the recording chain is configured to Polyhymnia International's specification, and the equipment is detailed in the recording documentation. As well as being notable for their outstanding musical and technical standards, the Caro Mitis CDs are noteworthy for their high standard of presentation. As well as an erudite essay on the music, there is detailed information on the performers, their instruments and the provenance of the scores. Caro Mitis translates from the Latin as 'succulent fruit'. These CDs from an enterprising Russian label are indeed succulent fruit compared with the desiccated offerings that have become the norm in the era of digital accessibility. No review samples used in this post. Also on Facebook and Twitter. Any copyrighted material on these pages is included as "fair use", for the purpose of study, review or critical analysis only, and will be removed at the request of copyright owner(s).